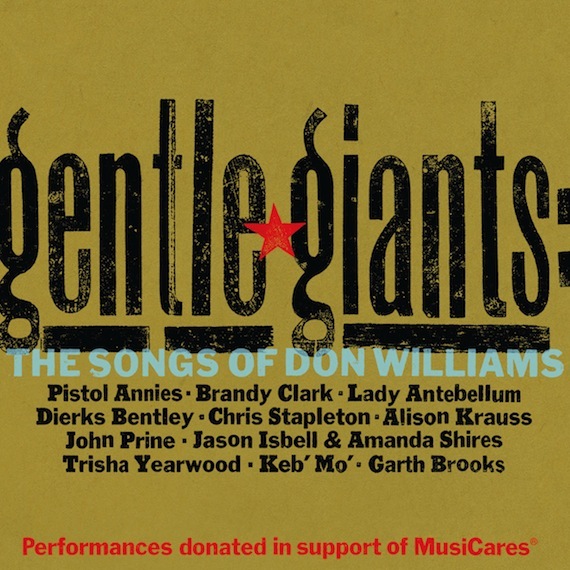 A Don Williams tribute project, Gentle Giants: The Songs of Don Williams, has been assembled and produced by Williams ‘ longtime producer and friend Garth Fundis. The new project will feature an all-star lineup of artists including Dierks Bentley, Garth Brooks, Brandy Clark, Jason Isbell & Amanda Shires, Alison Krauss, Lady Antebellum, Keb’ Mo’, Pistol Annies, John Prine, Chris and Morgane Stapleton and Trisha Yearwood honoring Williams and his five-decade legacy of music. Gems like “Good Ole Boys Like Me,” “Tulsa Time,” and “I Believe In You,” all appear on the new project. The 11-track album is set for release May 26 on Slate Creek Records, in honor of Williams’ birthday the following day. Williams announced his retirement from performing last year, capping a career that includes two CMA Awards, two ACM Awards and 17 No. 1 hits. All artist performances on the album were donated in support of MusiCares, the charitable foundation created by The Recording Academy, which provides critical assistance for those in the music field in times of need. A majority of proceeds from the sale of the album will go to MusiCares.